This family-friendly apartment hotel is situated in the heart of Florence, in a quiet, peaceful area. Every museum, theatre or important monument in Florence is easily accessible from the establishment. The immediate vicinity is home to a range of dining opportunities and shopping venues. Sights such as the Duomo, the Ponte Vecchio and the Uffizi Art Gallery are within around 200 metres of the property, and the town of Pisa, with its famous leaning tower, is around 60 km away. This city hotel comprises a total of 3 apartments, providing real comfort, elegance and exclusivity. The units offer a bright atmosphere, elegant furniture and finishes featuring prestigious materials. Found in Florence’s old town, the Rivoli Boutique Hotel is a lovely 4-star retreat steps from the city’s Santa Maria Novella station and the fashionable shops lining Via della Vigna Nuova. 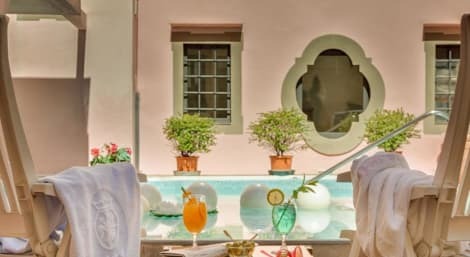 This TripAdvisor Certificate of Excellence winner is defined by charming, Florentine touches, set within a 15th-century convent, with a patio and garden, Jacuzzi, gym and meeting facilities. All rooms are cosy havens from the bustling streets outside, with satellite TVs and air conditioning. This is a modern property. 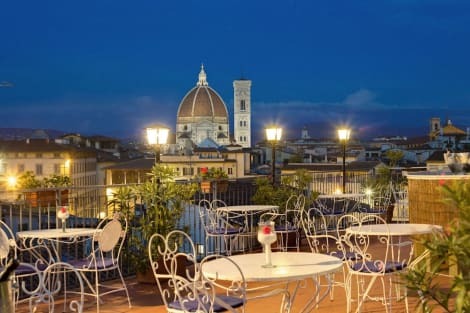 The 4-star Grand Hotel Adriatico is nestled in the historical heart of Florence, steps from Santa Maria Novella station and a short walk to the Duomo. The cosy rooms come with free wi-fi access, LCD TVs and air conditioning – perfect for relaxing in the shade before working up a sweat in the on-site fitness centre. When evening comes, make your way to Restaurant Opera or Restaurant La Vela to sample local Tuscan specialities and international favourites, and plenty of good wine. Set in a stunning 15th-century Renaissance palace, the 4-star Hotel Palazzo dal Borgo blends classical décor and atmospheric rooms with an enviable setting in Florence’s historical centre. A TripAdvisor Certificate of Excellence winner, the hotel has plenty of tranquil spaces, with a courtyard garden, charming lounges, an internet corner and an American bar. After a long day, relax in romantic authentically styled, Florentine rooms with free wi-fi, LCD TVs and air conditioning. Featured amenities include dry cleaning/laundry services, a 24-hour front desk, and multilingual staff. Event facilities at this hotel consist of a conference center and a meeting room. Self parking (subject to charges) is available onsite.